Well, the little boy who used to pull my hair, call me “Twace,” and stand on his bed to launch toys off of his ceiling fan is now a husband. 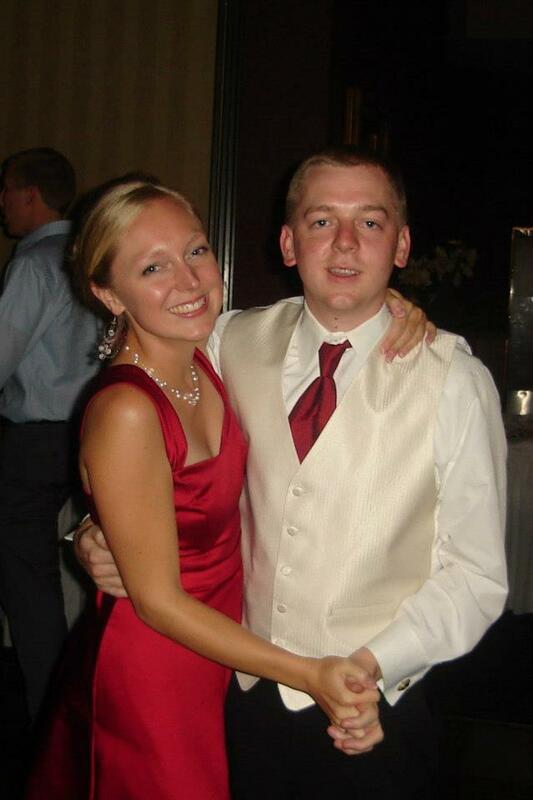 Love’s joy and mystery were palpable as I watched my younger brother Nathan get married last weekend in Cincinnati. I had a front row seat to witness the unexpected tears at the corner of his eyes that mirrored Jenni’s as she stepped into the aisle with her Dad. It is always a miracle to watch two people vow to become one body and one soul. And the fact that it was my brother and his wife plunging into the sacrament was just plain cool. Following the beautiful Mass, we headed to the reception where we raised our glasses and shook our groove things late into the night. I mean, we really danced. Their beaming happiness spilled over and filled my heart with happiness, too. I wished the day would never end. At the same time, I’ll admit it: It feels different to go to weddings and receptions now that I have chosen a path that will not include marriage. Amid all of the joy, there are moments when I feel a bit sad or perhaps out of place. I am usually the only future nun among all of the guests at a celebration that revolves around couples. I’m still getting used to the idea that from here on out, while most of my friends are married, I will usually be “date-less.” It feels strange to attend events alone, because my life is filled with company and community. Although I am not committed to one person romantically, I am committed to the Sisters and specifically to my five housemates in a much deeper way than simply sharing a refrigerator. I’d love to have one or some of them with me to celebrate the important moments in my loved ones’ lives. Anyway, I can certainly hold my own and manage to have a blast without a date. It’s not like everyone sits, talks, and dances with only their significant other. However, sometimes it would be nice to have a built-in travel companion, conversation buddy, and go-to-dance-partner. Maybe other single friends can identify with this. Then, there are the uncomfortable situations that can arise because although I’m dateless…I’m not single in the sense of being “on the market.” You know the moment – the bride shimmies out on the dance floor with her bouquet in hand, and the DJ spins “Single Ladies” by Beyoncé. Time for the famous bouquet toss. At both my brother’s wedding and a wedding in June, a few well-meaning friends encouraged me to “get out there!” with the single girls because I’m “not a Sister yet!” I thought to myself and realized that I really didn’t want to. It’s sort of exciting for me to feel I don’t belong out there, elbowing people to catch the flowers, because it means that I have already committed my life to a certain direction. I'm not an "eligible bachelorette." I've made a choice, and I’m serious, reverent, and joyful about it, just as I would be about an engagement. This inner commitment is not outwardly signified like an engagement is with a ring, and that can make for some interesting encounters. At the June wedding, I noticed a young man stealing glances at me from across the dance floor. Later, we ended up in the same conversation and introduced ourselves. His eyes were flirty. What do I do here? “Hi, I’m Tracy, and, just to put it out there, I’m going to be taking a vow of celibacy in a few years.” Not really the conversation to have while everyone else is doing the Cupid Shuffle around you. So, I let him talk. Although a tad bit intoxicated, he was sweet and well-meaning. He shared how I had distracted him during the wedding Mass for which I was the vocalist. Apparently, I and my singing voice are both “so beautiful” that he had watched me the whole time instead of the couple getting married. I’ll be honest; it was flattering to be called beautiful. That’s not really a daily occurrence in the life of a future Sister. But I would never want to give anyone the wrong idea. I sighed, and, awkwardly, I told him I was going to be a Catholic Sister. I’m pretty sure he didn’t know what that is. Maybe I should start bringing a cut-out of Jesus with me to these things. I never expected to find myself in this life situation. Growing up, I couldn’t wait for my wedding day. I wondered how it would feel and who would be waiting for me at the altar. My bridesmaids would wear light blue dresses, and my Dad and I would dance to “Butterfly Kisses.” According to my high school life plan, I would meet the right dude in college. We would marry soon after graduation, and I would have my first kid at 25. It would be magical. Even once in college, looking at it through slightly more mature eyes and a bit more life experience, marriage still held an element of magic. I took a Christian Marriage class at the University of Dayton with my housemates. We discussed all that goes into the persistent and often not-glamorous decision that married people must make daily to continue living out that holy “I do.” This is what makes marriage so courageous and so stinkin’ beautiful. I loved everything that I learned and wondered when I would experience it. Life after college took some unexpected turns. A few months after my return from Ecuador and well into a process of discerning the religious life, I started dating an incredible, one-in-a-million man. I knew that I desired to live a life of radical service and faith but still wondered if I might be called to do that within a marriage. If I was, this would be the guy. We shared a deep, Christ-centered, and joyful relationship. I wanted so badly to feel called to marry him. I pleaded with God. But the annoying little nudge toward the religious life that started on the beach in Ecuador simply would not subside. Now when I attend weddings, I find myself imagining what our day would have been like. At Nathan’s wedding, in the parish where I grew up and with our family around, I could picture it effortlessly. My heart aches a bit thinking that through. There is a huge part of me that still yearns to know what it would feel like. Something that you dream of from childhood on doesn’t just go away quickly. How elating it must feel to hear someone say, “I take you as my wife.” And to be able to say back to them freely and wholeheartedly, “I take you as my husband. God called me to enter into this sacramental commitment with you, and I say YES with my whole life.” That’s powerful stuff. I marveled at the simple splendor of it all as Jenni and Nathan exchanged vows. It was like peering with fascination at a beautiful artwork through the barrier of glass casing. I can observe it and admire it, but I'll never touch it, feel it, or behold it in its totality. I still sometimes resent God that I wasn’t made for that kind of union. And probably a few nights a week, I go to bed wondering, "Can I really live my whole life without that kind of love?" But even in the moments of wishing and wondering, I feel a quiet certainty and whispered joy that I have begun walking the path that God has dreamt for me. God’s grace reminds me that my life will be characterized by different experiences of love. I feel the Spirit saying, “Yes, marriage is incredibly beautiful. But, trust me: I’m calling you to do something else more beautiful than you could ever imagine.” The religious life itself is a treasure characterized by its own sacred magic and its own courageous day to day re-dedication. Love experienced in the religious life is talked about exponentially less than romantic love, so I am discovering its richness as I go. The religious life shows us God’s love in a wide and abundant way. It's like how my "datelessness" allowed me to bounce around last Saturday night, dancing and spending quality time with various people. 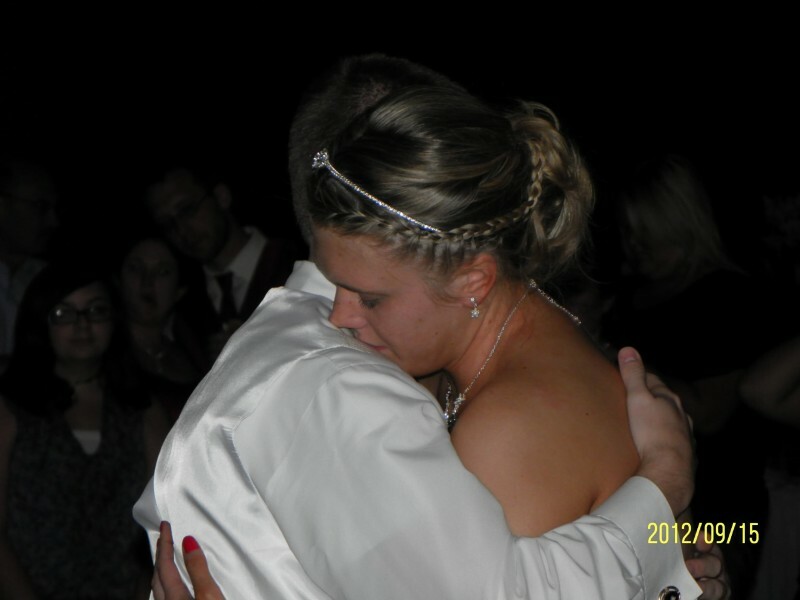 I shared slow dances with my brother, my Dad, my uncles, an old neighbor, my aunt, and a groomsman. I didn't experience the beauty of gazing into the eyes of a romantic partner during the slow songs, but my life gives me the unique gift of looking all around and meeting the gazes of many. I hold dear this openness and availability to freely love countless people and to follow the Spirit where it leads. That is the way my heart was made to give and receive love. Dreams of my wedding day are being replaced little by little with exciting images of the day when I will make vows with the Sisters of Charity, surrounded by family and friends. A life of great love is beckoning me to the dance floor! With questioning emotion in my stomach but faith in my heart, I choose to step up and bust a move. Debbie Downer...and Proud of it! I thought back over the weekend and shared the first thing that came to mind. Sisters Peggy, Carol, and I had spent Saturday afternoon at a free showing of 8 Murders a Day, the second movie in a documentary trilogy by filmmaker Charlie Minn. It chronicles the horrific violence in Ciudad Juarez, Mexico, since 2008, specifically focusing on 2010, which was the most deadly year yet. Peggy, Carol, and I knew many of the facts about the violence happening right across the border, but it was something to see the progression laid out so clearly. The graphic images of the crimes committed were haunting. A sense of sadness and pain left a hole in my stomach. As I shared with my friends how the movie had affected me, I felt the conversation get really intense really quick, and then pretty soon, there was silence hanging in the air. Not exactly a topic that lends itself to friendly chatter. Lately, I find myself doing this often. After I brought up the movie, I racked my brain to think of something, anything “normal” and “fun” to talk about. I didn’t come up with much. I remembered that Carol and I had spent Thursday afternoon in Mexico after our usual morning at Proyecto Santo Nino, the Sisters’ clinic for kids with special needs. We walked around downtown and visited churches in Juarez, with Brian, a 13 year old with spinal bifida, Reyna, a 3 year old with Down Syndrome, and Reyna’s parents. It was a beautiful thing to share the day with them, but sobering as well. Brian’s body is contorted, and he walks with difficulty. After lunch, he asked to borrow one of Reyna’s little diapers because he forgot to bring one of his own. When the fun was over, we dropped Bryan off at his tiny little home where he is often left to look after his little siblings because his irresponsible parents neglect them. I stopped myself before I shared that little light-hearted anecdote. The next images that flooded my mind were the faces of people who had come to Sacred Heart Church on Friday looking for help paying their rent or bills. One woman had cried as she handed me an eviction notice; another swallowed back tears as she told me that her husband had been picked up by Immigration the week before. She’s now alone with her two small children, simply awaiting the news of his deportation. Thankfully, the group of people I was with that Sunday night probably didn’t mind talking about 8 Murders a Day. They are faith-filled people who inspire me with the way they serve our community and make an effort to be socially aware. Also, living on the border, the topics of violence and poverty are common. We all know people who have been personally affected. Nevertheless, my inner dialogue reminded me just how totally my life is characterized by these relationships with marginalized people. The situations that so readily came to mind reflect all that I carry in my heart as a result of what I do on a daily basis. My encounters with human suffering have taught me a new language with a new vocabulary. Sometimes, that language is speechlessness. When I do talk, it’s not about the things I used to talk about. In certain circles, I am hard to relate to. I struggle to find things to say, and I think people don’t always know what questions to ask me. Even my own family members or other people who genuinely want to know might not know how to approach the subject. And then, there are people who don’t want to know. A friend reminded me the other day that sometimes people might choose not to ask because thinking about human suffering is hard. This is not exclusive to religious life. Many young people who come back from international (or domestic) volunteer experiences may find it hard initially to slip back into the life they led and conversations they had before. People who work with underprivileged populations, who teach students from inner-city neighborhoods, who provide health care to people who can’t afford it, etc. – their worldview changes and so does their way of being in the world. When you make a choice to really open yourself to the action of God; when you take a sincere look at our world; when you come into relationship with people who are suffering and let it affect you - things change. Your heart changes, your thoughts, your prayers, what you put your time and energy into. The stories of the people that you walk with become your stories. Conversion and the stories that fuel it are a gift to our world. I cannot hold back from sharing these experiences because I must be authentic. I must share all that I see, hear, taste, touch, and feel so that others, who don’t get to experience it firsthand, will know. I have to risk sharing those “Debbie Downer” moments because they are real, and they are people’s lives. For me, this is a huge part of what becoming a “Sister” means. I recognize that every human being is a part of my family. I accept their burdens and joys as my own. I speak up when the voices of my suffering brothers and sisters are stifled. This is the Truth that I bring and a way that God uses me as an instrument. Of course, I also bring countless stories of grace and joy. I don’t feel like a “Debbie Downer” every day. But when I do, I will remember to be grateful for the unique life perspective I have gained and for the beautiful people that have shown it to me. It is a privileged position. I look to the example of the Sisters and other friends in my life who speak fearlessly and lovingly what they know to be true. Seek the Truth in service to others and share what you find. The world needs your voice!